This section of a plate with a diameter of 7″ (17.8 cm) shows the scalloped-and-serrated rim that is typical of much of the cut glass produced during the American Brilliant Period (Image: Internet). That is, there is a distinctive notch, that resembles the letter V, between the scallops. (If one considers the sharp serrations on either side of the V (its “shoulders”), then one might describe this feature as resembling the letter M.) However, on many items made by T. G. Hawkes & Company with scalloped-and-serrated rims, this V-notch has been replaced with a U-notch, as shown in the drawing on the left, below, which is taken from Hawkes’ 1897 patent application for his Festoon pattern. Hawkes usually used the U-notch on other similarly scalloped-and-serrated rims as well, not just on those that framed patented patterns. Interestingly, the U-notch is not limited to items made by T. G. Hawkes & Company. Two major Corning, NY cutting shops, each founded by a former Hawkes employee — the O. F. Egginton Company and H. P. Sinclaire & Company — also often used this style. One example is shown here. The drawing above, on the right, has been taken from Egginton’s 1903 patent application for the pattern known as “Magnolia.” In addition, and somewhat unexpectedly, there are a few items in catalogs from C. Dorflinger & Sons that also have this U-notch. The items are all cut either in Hawkes’ patented Brazilian pattern or in that company’s Cobweb pattern. In the Dorflinger composite catalog these patterns are identified either as Brazilian or pattern No. 643 which was Hawkes’ name for his Cobweb pattern initially (note 1). Using correspondence between Hawkes and Dorflinger during the years 1887 to 1892, Spillman reports that “Hawkes provided hundreds of [cut glass] articles in the following patterns to Dorflinger” (Spillman 1996, pp. 91-92). She then lists several Hawkes patterns, including Brazilian and Cobweb (as well as Dorflinger’s patented Parisian pattern) and concludes that “There can be no doubt that from 1887 until 1893, and probably for several years after, T. G. Hawkes supplied a significant amount of cut glass to C. Dorflinger & Sons for resale as Dorflinger glass” (Spillman 1996, p. 94)(emphasis added)(note 2). Most investigators now believe that the Brazilian and No. 643 patterned articles shown in Dorflinger catalogs were actually cut by Hawkes (note 3). Additionally, Dorflinger actively sought finished items from T. G. Hawkes to bolster his company’s stock at White Mills, as well as to use as consignment items for sale at his showroom in New York City. Although it is not the subject being discussed here, comments concerning two of the cut-glass motifs shown on the “kettle drum” bowls are appropriate. The bowl on the left has fields of cross-cut diamonds between vertical pillars. 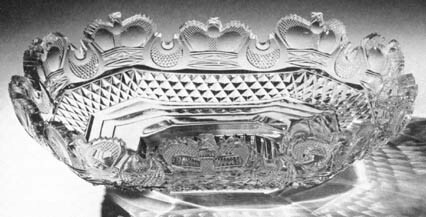 The earliest dated use of the cross-cut diamond motif on American cut glass that the writer has found to date is 1844 on a tumbler (Palmer 1993, p. 115), but it was probably in use at least a decade earlier. The bowl on the right has curved, convex pillars (“tusks”) that are similar to those used by J. Hoare & Company in its Croesus pattern (c1890). In these examples U-notches are prominent, and their dates are at least fifty years prior to the founding of Hawkes Rich Cut Glass Works. The final example of a U-notched rim that could have influenced T. G. Hawkes is, coincidentally, from his home country. 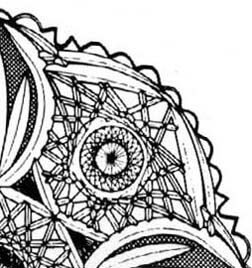 The image below shows a section of a saucer made at the Potter’s Alley Glass Works (Dublin) of Thomas and Richard Pugh and purchased at the factory in 1890 (MacLeod n.d., p. 23). It was probably made during the previous decade, but because it is a replacement dish for an epergne it could have been made earlier and kept in storage until needed. The style of cutting is typical of the (International) middle period. Note that U-notches are used between the serrations (“teeth”) as well as between the scallops. Knowledge of the U-notched rim has practical use for today’s dealers and collectors. For example, its presence on items cut in “generic” patterns such as Russian and Strawberry Diamond and Fan can be used to attribute such items to T. G. Hawkes & Company with a high degree of confidence. Its occurrence can also confirm nineteenth century Hawkes cuttings when the exact pattern is absent from catalogs and the acid-etched trademark was not yet in use. In addition, the presence or absence of the U-notch can uncover cases of forgery, a subject of growing concern, especially in these days of Internet buying and selling (note 4). 1. C. DORFLINGER & SONS, FINE CUT GLASS. American Cut Glass Association with the Dorflinger Glass Museum and the Rakow Library of the Corning Museum of Glass. 1997 (xliii + 150 pp). Althoughg Dorflinger used the name Cobweb in correspondence prior to 1889, he never changed pattern No. 643 to Cobwel in his catalogs. There is a hint that he intended to do so, however, on p. 13 of this composite catalog, where someone at some earlier time had neatly crossed out the pattern name No. 643 beneath a water bottle cut in the Cobweb pattern. Unfortunately, no substitute name was added. It is not known eactly when Hawkes changed the name of pattern No. 643 to Cobweb. Items were ordered as pattern No. 643 in 1885, but “by 1888” orders were being placed for Cobweb (Apillman 1996, pp. 179, 184). The first section of this composite catalog is, in turn, made up of three “nearly identical” catalogs and given the date c1886. This date is incorrect, however, because this section includes Hawkes’ Brazilian pattern. The name “Brazilian” was not chosen by Hawkes until the spring of 1889 (Spillman 1996, p. 186). On this basis alone this catalog section should be dated c1889; however, because it also contains examples of the Belmont and Dresden patterns the date must now be moved even further forward, to c1891 when these patterns were first introduced. This is a recent discovery (see The Fan Scallop file for details). The second section of this catalog consists of “two similar but not identical catalogs” and has been dated c1895. It is significant that no article in this section can be attributed to Hawkes, suggesting that Hawkes had stopped sending cut glass to Dorflinger by this date. 2. The reader is referred to Spillman’s book for a complete list of the patterns Hawkes cut for Dorflinger. Only a few, specific articles in the first section of the composite Dorflinger catalog can be positively identified as having been made by Hawkes. All of these items have, in addition, rims cut in what is called the later, or regular, style. 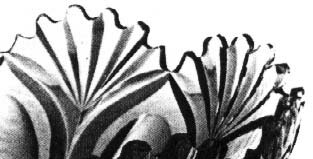 This feature provides confirmatory evidence that these articles were made by the Corning company because Dorflinger was using a different style of fan scallop, the early fan-scallop, at this time (see The Fan Scallop for details). Additional catalog items in the Cobweb and Brazilian patterns were probably also cut by T. G. Hawkes & Company, as pointed out by Evans and Mitchell (see note 2 above). A champagne jug in the “White Paint Catalog” (c1890), p. 129 center, cut in the Russian pattern, was also made by Hawkes. 3. Evans, Bill and Dow Mitchell, 1999: One bud nipped, The Hobstar, Vol. 21, No. 5, pp. 13-14 (Jan). However, for a contrary point-of-view see Dorflinger, David, 1999: One bud nipped — information or misinformation?, The Hobstar, Vol. 21, No. 6, pp. 13-14 (Mar). 4. The reader can practice applying his knowledge of the U-notch by using the notoriously inaccurate five books by Bill and Louise Boggess. 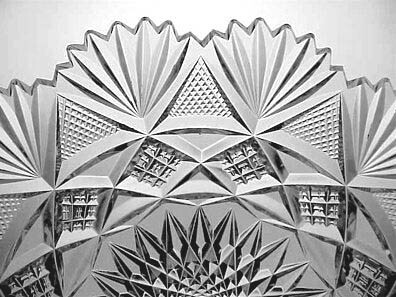 For example, in IDENTIFYING AMERICAN BRILLIANT CUT GLASS (third edition, 1996) a plate that is actually cut in Clark’s Jewel pattern is said to be cut in the Cambridge pattern by Hawkes (fig. 284). Another plate is said to represent the Astor pattern by Hawkes (fig. 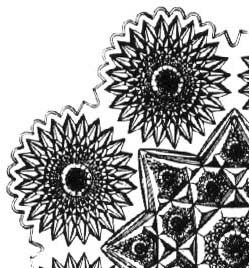 271), but it is actually an example of Dorflinger’s patented Colonial pattern (as is the image at the beginning of this file). In addition, this plate is “signed Hawkes” and is, therefore, a forgery. Neither plate has the U-notch.